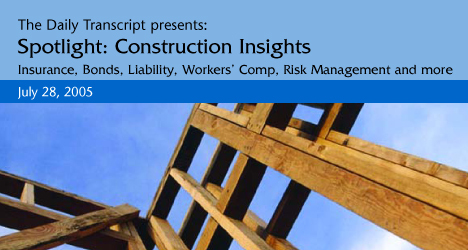 In this spotlight section, we uncover construction insurance issues, coverage options and updates on construction law. As the number of residential condominium construction and conversion projects continues to rise dramatically in San Diego and throughout Southern California, all the entities associated with these projects are becoming increasingly concerned about potential liability exposures associated with them. The entities involved typically include the developer, architect, construction companies and, in the event of a conversion, the company selling the property that is to be converted. Tired of the volatile property and casualty insurance marketplace? Are insurance carriers benefiting off your performance over the years? Do you have the ability to hold significant premium dollars for exceptional risk management performance? If your answer is no, a captive insurance program may be suited for your business. California requires all contractors to hold a valid contractor's license and there are harsh penalties for those who are found to have contracted without a license. Contracting without a valid license is considered a crime and may be punishable by jail time, a fine or both.